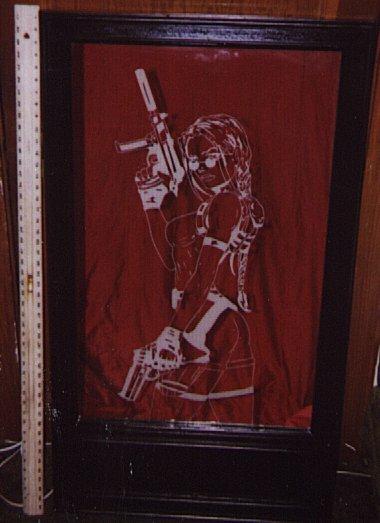 This is an etched Mirror of Tomb Raider's lovely Lara Croft. Only ONE of this kind has been made. The mirror, with frame, measures approx. 48" long and 26" wide, with a thickness of about 2". The pictures below do not begin to show the true beauty of the work, as it is hard to get a good picture of a mirror. The picture in color is reflecting a red sheet which we held to block our view from the camera, the other is the same picture in black and white, which shows a little more detail. The mirror weighs about 23 lbs and the shipping should be around 40 dollars Buyer will be pay shipping in addition to price. Great Deal for this one of a kind item. 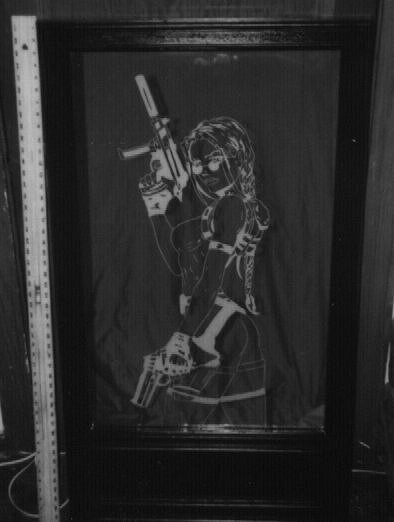 go there, and search for "lara croft"
Bidding starts at $150.00, payable by cashier's check or money order. Auction ends at 5/12/99 at around 6 pm central.